Oh, there is sooooo much more you can do than this! As far as diet goes, if you have been diagnosed with cancer or you are fearful that you may have cancer and you want to take precautionary or reactive steps...diet is HUGE! Begin by consuming a whole, raw food diet as noted above. This includes eating a diet primarily of organic frutis, vegetables, nuts and seeds. You might also consider adding juicing or smoothies to your diet. Juices and smoothies are a powerhouse of nutrition. 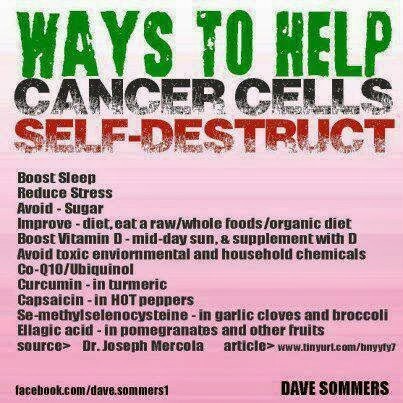 You also need to look at other factors...cancer is known as a disease that literally eats you from the inside out and is often encapsulated in your emotions and stress level. Basically, you need to assess, "What is eating at you? ", "What is tearing you up emotionally", "What is it that you absolutely have not been able to let go of? ", "What is bothering you and literally allowing your body to lower it's immune system to the point that it cannot fight off disease?" Another area to look at is your Ph balance. It is a well known fact that cancer or any disease for that matter cannot survive in a slightly alkaline system. Your blood Ph needs to be between 7.3 and 7.5 in order to effectively fight off disease. This means that your saliva and your urine should test in the area of about 8 on a Ph strip. There is sooooooooo much more!!! I cannot go into all of it here at this time but please consult with a Holistic Health Practitioner who is knowledgable about natural remedies and alternative healing.